What Is an Executive Board Member? An executive board member sits on a company's board of directors and advises current company management on their business operations. While most publicly held companies have a board of directors, other organizations--especially hospitals, educational institutions and non-profit groups--may have an advisory board as well. An executive board member is an individual chosen for a company’s board of directors, which will oversee the current company management. The board members are bound by the organizational bylaws regarding electing members, reviewing current management, governing company policies and approving budgets. The board of directors also serves the shareholders, ensuring that the company is generating profits and increasing in economic value. Individual board members are usually people who are familiar with the industry with which the company is affiliated. While a board member does not need to have a business background, many individuals selected have a specific skill set that adds validity to the board of directors. Former politicians, high-level academics and executive management are usually selected as board members. 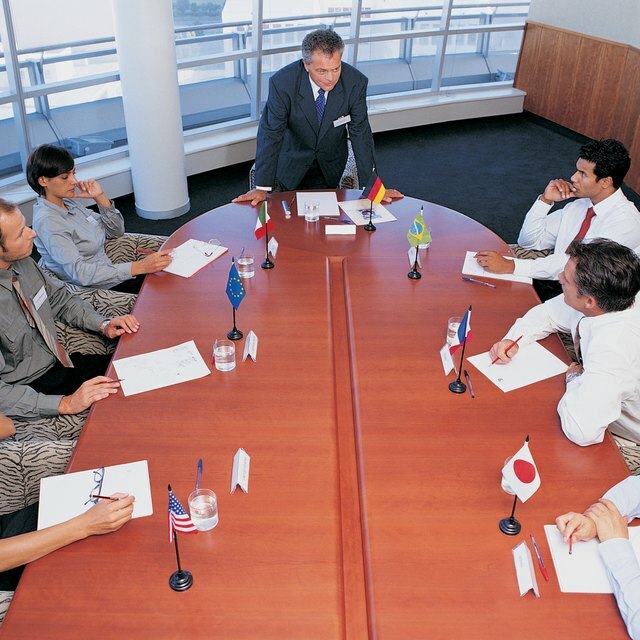 An executive board member can have a wide range of responsibilities for a company. She will usually review company performance and the effectiveness of current executive management. If the company is operating below standard, the board will make recommendations to improve operations. Some individual members focus on parts of the company relating to their expertise and provide guidance on these issues. Common law dictates that the entire board has meetings to discuss business issues and a quorum must be present prior to voting. Who Appoints the Board of Directors in a Corporation? What Happens in a Board Meeting? Executive board members have a fiduciary duty relating to outside investors regarding the company’s financial health. In order to provide an objective view of the company, board members cannot have any conflicts of interest with the company. Excessive compensation, stock options or kickbacks are illegal because they will impair the Board when voting on important company issues. Information on board members must be disclosed to outside investors to obtain a high level of transparency regarding the individuals advising company management. Although the board of directors is usually filled with reliable and trustworthy individuals, misleading information may be given to the board. Management may present negative information in a positive way, hoping that the board will continue to approve current operations. Additionally, because board members only meet a few times a year, they may not know each other very well and may not understand the company culture. This may create board members who do not want to cause strife during their meetings and simply accept company information as presented.